Can LG's £280 all-in-one home cinema system impress audiophiles? In recent years, LG has developed into a brand to be reckoned with, not least because its LCD and plasma flatscreens have been critically lauded. LG have also brought us products in many different sectors of technology, including the new HT903TA home cinema speaker system to compliment it's flatpanel TVs. However, speaking to the company some time ago, it was made clear to me that the brand recognised an inherent weakness with its flatpanels – indeed with thin TVs in general – which is that they don't sound very good. With this in mind, LG have designed the HT903TA to address this weakness. This weakness goes beyond the criticisms that can be levelled at their performance with Dolby or DTS soundtracks, and way beyond the fact that many suppliers foolishly seek to synthesise surround sound from just two or three speakers. The problem is more fundamental: that flatpanel TVs are simply the wrong shape to perform respectably as loudspeakers – and the resulting sound they make is coloured and, usually, lacking in clarity and intelligibility. Boffins from LG told me they understood the problem, and resolved to do something about it. The most dramatic demonstration of this good intent was to co-opt one of the most famous of all audio designers to fine-tune some of its products, namely the eponymous Mark Levinson, who once owned a company of the same name – now part of the Harman group. But is this more for show than a practical measure? I would argue that the LG products that bear the Mark Levinson imprimatur, including the LG HT903TA system tested here, are Levinsonesque in name alone – as anyone who has used the real thing can testify. Still, LG has some other bright ideas up its corporate sleeve, of which the HT903TA is a good example. 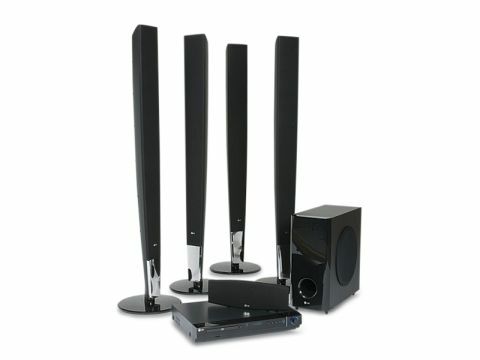 It's a full-on, all-singing, all-dancing home cinema system that includes a DVD player (not Blu-ray, although in principle a Blu-ray player could be plumbed in via HDMI); a 5.1-channel amplifier with all the usual surround decoders; and a full 5.1 set of loudspeakers – a centre, speakers for each corner of your viewing room and a subwoofer. Given its job description, it costs surprisingly little at around the £290 mark – give or take the odd groat. The system comes in an unfeasibly large outer box, but when its contents are decanted, you find a remarkably complete package, with science applied to keep everything neat and tidy. What looks at first sight like a slimline DVD deck turns out on closer examination to be the amplifier/DVD player. If it all looks a tad too dinky to be convincing, it's because the normally large, heavy and hot-running amplifier is fully digital. The system has some useful refinements. A built-in FM tuner gives good sound quality in stereo, and video upscaling to 1080p is available from the internal DVD player via HDMI. The system will even run from a USB source – an MP3 player or an iPod. Surround sound comes courtesy of Dolby Digital and DTS, Dolby Pro Logic II and a 10-channel surround algorithm from LG itself, called VSM (Virtual Surround Mode – 'virtual', of course, a synonym for 'not'). Some of the toys are less than they appear to at first sight: in particular the 10-channel effect is really not worth the paper it is written on – it certainly doesn't amount to an audible improvement in my view. And don't imagine that the video upscaling transforms the modest DVD player that comes with this system into a rampaging high-definition monster. It doesn't. I was, however, impressed by the players ability to cope with almost anything 12cm and round, audio and video. Another example of the LG system's reach being greater than its grasp concerns the quoted 1,000W power output, which is simply science-fiction. The claimed output of 155W per channel at 10 per cent distortion level probably translates to, at best, 40W at an industry standard 0.1 per cent distortion level, and you don't need a room full of measuring equipment to tell: this is how it sounds, too. The system quickly becomes breathless if pushed too hard. My main point of comparison for this test was the speakers and amplifier that are supplied as part of Panasonic's TX-37LZ800, which is a mid-to-upmarket example of a modern TV. Although it suffers from typical shortcomings of what might be called 'flatscreen sound', in my experience it is one of the better performers around. From the outset it was obvious that the LG system sounded better: bolder and warmer, leaving the Panny's internal speakers seeming rather scrawny. With normal sources – a news channel – the sound was thin and unintelligible, thanks to a rather 'floaty' ill-focused midband. Through the LG system, the audio was palpably richer and more vividly coloured. The bass still wasn't good, though. The Panasonic doesn't really have any, while the LG system has a rather bloated upper bass, which is as close as the speakers get to generating real throb. Not really surprising, given the limited internal volume of the enclosures. The subwoofer makes little difference in practice; it sounds slow and rather blurred, and it's often easy to ignore its contribution. But the colourful, relatively intelligible midband makes up for these deficiencies, and this in my view is where the LG's strength lies. To an extent, the LG HT903TA is at the mercy of its ambitions and its low, low price, but LG must be given credit for what it has achieved. The system makes no pretence at high fidelity, but it is elegantly good-looking, simply but adequately equipped and it performs in a highly presentable way, easily outperforming the competition – namely the speakers that you get as part and parcel of your flatscreen TV. And it does this without having a ruinous effect on your wealth.